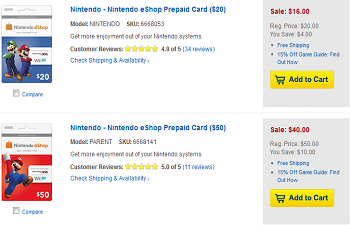 Best Buy is currently selling prepaid eShop cards at a 20 percent discount. Christmas is literally just hours away and we're more than sure that out there somewhere is some poor sap who just plum forgot to get a present for a family member, friend or secret lover. Now, of course, with it being Christmas Eve and all, there is still a chance to go fight your way through the throngs of other last-shoppers-shoppers and get said acquaintance the perfect gift. Then again, if they're a Nintendo fan you could instead just stay home and order them an eShop gift card from Best Buy. Granted, Best Buy isn't the only place that sells eShop cards, but it's the only place that we know of that's currently selling them at a 20 percent discount. Available both in-store and online, customers looking to invest in some eShop credit can buy a $20 card for $16, a $35 card for $28 or a $50 card for $40. Of course, this sale isn't just limited to Christmas gifts for others. Nintendo fans can obviously buy cards for themselves and take advantage of the considerable price cut being offered. I personally might pick up a card just so I can buy some of the Virtual Console games on 3DS that I've been meaning to play (here's looking at you Link's Awakening). What about you? Will you grab a card and if so are there any eShop releases in particular that you're planning to spend it on?